Liverpool low: Can the once mighty Reds rebuild? Liverpool's awful start to the season is their worst since before Bill Shankly arrived at the club in the 1959. Just when Liverpool fans - supporters of the once mighty powerhouse of European football which is now saddled with debt, suffering misfiring players and with no league title win since 1990 - thought it couldn't get any worse, it did. As hosts to top-flight new boys Blackpool and in desperate need of a win, Liverpool unbelievably lost to the orange-clad minnows of English football 2-1 in front of the Anfield faithful. Considering the Reds have won only two of nine games in all competitions so far this season and were eliminated from a domestic cup by fourth flight Northampton recently, I can't remember a time when they have been so low. What’s worse, I don’t see improvement anytime soon. I will be honest with you. I grew up a huge Liverpool supporter. My first love was Benfica, my hometown club in Lisbon, but in my early teens I admired the Anfield club from afar. I was impressed by their quick passing game, their winning mentality and by the passion of their fans. My favorite player was Ian Rush, because at the time I played as a striker myself, but their group of players in the Eighties was phenomenal. The decades that followed were tough. The Nineties were poor by club standards and with the exception of the 2005 Champions League victory, the next decade was disappointing as well. In fact, looking back, there were quite a few barren spells, but still, I believe right now Liverpool are probably at their lowest point of recent times. Without a title league title in 20 years, in financial disarray and with limited talent in their squad, arguably Anfield has not seen such dire straits since the 1950s when the side were relegated to the second tier. 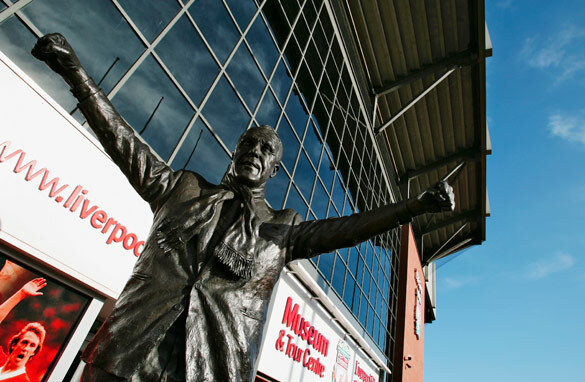 The arrival of the legendary Bill Shankly put the club on the right track back then, current manager Roy Hodgson has a Herculean task on his hands to turn things around again. So who is to blame for the club’s predicament? It’s easy to blame Rafa Benitez, and I think the Spaniard is definitely a major reason for the team’s demise, but the root of the problem goes back to the days of Graeme Souness and Gerard Houllier. From poor signings, to letting club idols like Steve McManaman, Robbie Fowler and Michael Owen leave, there have been too many mistakes to document. I actually believe the main problem at Liverpool at the moment is a lack of identity. There are only two local players left, and their supporting cast has changed virtually every season for the last decade. Houllier and Benitez brought in too many average overseas players who did nothing but increase the expectations on the talented few. Look at the team now. Players like Kyrgiakos, Lucas, Maxi Rodriguez, David N’Gog are not good enough to play for the club. Above them, you have a group of players with a higher level of talent, but let’s be honest, there are only three world class performers: Pepe Reina, Steven Gerrard and Fernando Torres. Not enough when in the Premier League, you have so many teams with money to spend. While Liverpool’s squad has slowly deteriorated, most other clubs’ have improved. That’s why the Reds find themselves in the bottom three right now. So what can be done to change, and is Hodgson the man to stop the ship from sinking? Well, I believe he deserves a chance. The veteran manager got an average squad with limited resources when he arrived and brought in a few players who haven’t had time to settle yet. Trust me, Christian Poulsen, Raul Meireles and Joe Cole are all good players and they will prove it sooner or later, they just need time to shine in a Liverpool shirt. The problem is, that time is a luxury in the world of football, and by the time the newcomers reach their potential, it may be too late for the club to challenge for any trophies. Unfortunately for all Liverpool fans around the world, the present and the immediate future do not look good. The way the season is developing, this team can only hope of qualifying for the Europa League, and to do that, they need to start winning some games soon. Very soon. Otherwise they could run the risk of getting drawn into a relegation battle. Think that is absurd? Take a look at the league table right now. Would be nice to see liverpool relegated at the end of the season! "So who is to blame for the club’s predicament?" What, no mention of the owners? Anyway, with three world class performers, you should be able to field a winning team. It is the coach's job to come up with a strategy. It is not a lack of quality on the roster, but a lack of decent coaching. in your hearts ....you'll never walk alone ! Pedro, you fail to mention the dire ownership we have suffered under Tom Hicks and George Gillette, with reducing investment and debt repayment meaning the need to gamble on some of the cheaper options you mention. No discussion of Liverpool's problems can omit the detested H&G. i am a fan of liverpool. i would suggest that the club's management need to do is to take full advantage of january 2011 transfer window to sign on quality and mature players. how? allow inventors from the oil rich countries to come in now and strenghten the financial base of the club – this has been a long standing issue. The club get what they deserved. They didn't go with the best person for the job but instead they went with an Englishman who has a decent record. That's borderline racism. The business of Football chanced since the 90s. ManU, Arsenal and Chelsea all chanced the way they run their clubs. ManC and Spurs aren't too close behind. Liverpool will be obsolete and irrelevant in a few years time if they don't evolve. It is a shame to see my beloved Pool in this sorry stage. The only blessing is for the club to be sold on a huge discount price (when they relegate) and the new owner / group instill new version for the club. Clearly a poorly researched article. You fail to mention at all why the club is debt ridden. The American owners perhaps? With so much debt how are managers expected to buy top quality players? Mascherano and Xabi Alonso sold for 50m, replaced by Meireles and Poulsen for 14m. And Aquilani is out on loan. Incredible how an article on problems at Anfield can miss the point so spectacularly. The blame for Liverpool's current predicament lies squarely at the feet of the clubs current owners. This great club is being slowly destroyed by two American asset strippers, end of story. This is absurd. How could you write a piece about "Liverpool Low" and not mention the disastrous ownership situation. Are you simply daft? Seriously? You write a whole article about the problems at Liverpool and not once mention messrs Hicks and Gillett? The blame for Liverpool's problems falls fairly and squarely at the feet of the owners, the debt they've lumbered on the club and the money men they've put in charge. Roy Hodgson may not have inherited a squad that would challenge for the title but he certainly inherited one that could get in the top half of the table – a squad that had, give or take one or two players, come within four points of winning the title one year prior, even with all it's 'average' foreigner. There are many things that are wrong about this article. The most serious, however, is your implication that what is wrong with the club is not its disastrous owners but instead players. Owners who have saddled the club with debt, refused money for players who were committed to sign, who have lied about stadiums and spending. To blame Liverpool's current performance on anything other than Hicks and Gillets' mismanagement and Roy Hodgson's outdated tactics is to misunderstand LFC completely. Also, Christian Poulsen is awful and has always been awful so clearly I cannot trust a word you say. Incredible article! Has a vague stab at identifying some of the problems, including, mistakenly in my opinion, laying a major part of the blame at Rafa Benitez' door, without even a hint of the real current curse of the club: Tom Hicks and George Gillett. Take a look at the URL and perhaps the paymasters of the correspondent show why this might be.....???? "Benitez brought in too many average overseas players"
And not a single mention of the ownership issue and the fact they've bled the club dry for over 3 years which lead to a mass influx of "average players" this summer. Useless article full of opinionated horse dung with no credibility whatsoever. Liverpool worst episode is yet to come.We should not only blame the players but the management played a major role in their downfall.Roy Hodgson is a great coach,I know he can turn an average team into a top flight but maintaining it,is a totally different story.They should start winning games soon or should consider themselver OVER and DONE WITH. The owners have allowed Benitex to sign in wrong players before he left,so we cannot blame the present manager.He only need to do his home work and bring the team back to winning ways again. I am sure if he does the job well the club will come up again. They certainly have quality in their players to be in the top 4, but I just don't think they have the mentality to be there just yet. They have to adapt to Hodgson's tactics. But also, teams like City and Tottenham are way stronger than they were two years ago. Liverpool really needs have a ultra fighting mentality to bulldog themselves into the top 4. Huge fan? You should at least know which division Northampton are from! The problem here? Owners who bought into something they knew nothing about. Sorry man, but US owners know zero about the game. All they have done is get this great club into debt and have the absolute cheeck to ask for a premium to sell it. Really. When Liverpool fail to qualify for Europe at the end of the season, which they will, the you know what will hit the fan. A complete travesty. Shanks must be turning in his grave. Right on the spot, except not mentioning the owners role. I say this because it is clear that you are either unfamiliar with the current climate in English football, or did not contribute the requisite time and effort into information gathering on the subject of Liverpool FC (or both), because not once have you mentioned the names Hicks and Gillett when talking about all of the "mediocre players" brought into the club. How you can write an article about Liverpool's current problems and miss mentioning them is appaling, although i'm not sure what's worse – you not having the knowledge outright, as a self-proclaimed fan of the club, or your disconnect from the world of European sport in general (the protests and campaigns against Hicks and Gillett have been featured in major publications worldwide, and in most cases in sections having little or nothing to do with sport). That's right: more than Barcelona, Real Madrid, AC and Inter Milan, Manchested United, Chelsea, Arsenal, Bayern Munich, and EVERY OTHER CLUB SIDE IN EUROPE. This is lazy journalism at its finest. I am amazed at the sheer lack of understanding this article shows regarding the problems currently bedeveling Liverpool. Pedro I'm your fan but sorry to tell u is lacking a lot of information and accuracy... Please do your homework before you decide to write an article... Good luck next time! I like you Pedro but seriously, you cannot discuss the recent woes of the club without mentioning the disastrous effect Hicks and Gillett have had on the finances of the club, transfers budget, morale of the team and the fans (do you even know of the tirade by Hicks Jr?). Robert Paulson (comment above) is right: we had some serious talents in Xabi Alonso (Real Madrid), Alvaro Arbeloa (Real Madrid), Javier Mascherano (Barcelona) and Yossi Benayoun (Chelsea) and can only hope Fernando Torres keeps walking the walk with those who won't let him walk alone when he has demonstrated such loyalty. Just look at where the rest are now – top-class clubs. You can't blame the players or the coaching staff when they hands are tied and their attention is distracted by the bigger problems. Given the animosity generated by H&G, as an American news provider, CNN should have done more research for this commentary. At the moment, LFC needs owner like from Manchester City who is able to pay the debt and buy more quality players. I agree with most of this comment, however, I do believe now the real trouble is GONE we have a good chance of resolving all of our problems. Just a word of warning, be careful who buys us or we will end up in the same predicament. Also, give some thought to the player's right now, it's been a major worry for them too.. Could you perform on top quality if you knew your job was on the line because that is how it has been for our beloved players. Now most of the worry is over wach what happens at the derby on Sunday. Liverpool FC we will always love and support you. I speak from a scouser in the USA, but still a scouser forever. YNWA!!! The first problem Liverpol have regardless of debt, lack of leadership, lack of home grown talent etc is their small stadium. When you compare Anfield and the money it can generate against the other Powerhouses, it pales into insignificance really. The other problem and this is no disrespect to the city, and to some extent United suffer the same problem, Liverpool and Manchester do not appeal as cities in the same way that London, Madrid, Barcelona and Milan do. At least for Utd, they can almost guarantee the odd title and good success whereas Liverpool can not. The only way liverpool will turn this around is to in the short term, buy their way out and for the longterm to set up a decent youth academy. In the interim, as much as i like Hodgson, even as a United fan, i felt that Dalglish was the only man who should have taken over from Benitez. This is for 1 pure reason. He is the last tie to the old Anfield Boot Room. As United are galvonized through the Munich disaster, Liverpool should be galvonized through the Shankly/Paisley ethos. Sadly for the club, the only way out right now is to attract the best players by spending the most money untill they have a squad good enough to win titles. They blew the chance by not investing wisely after the CL win in 2005 and they need to hurry up whilst they still have a chance to trade on the living memory of their success in the 70's and 80's. Soon, too much time would have passed for this to still be used as a relevance to attract top players. Apart from 500 million on a new stadium, the club will need to invest around 250 million on transfers alone in the next 18 months on top players and then another 75 to 100 million on wages for this new group of players. I just don't see the new owner being prepared to gamble so much money. Over 4 years, apart from the stadium, we are looking at an investment in 5 to 8 top quality players which will require at least 550 million in that period. Add 500 million for a new stadium and i just do not see it with the new owner. That is the equivelant of US$1.5 Billion on top of the US$500 already invested. The final piece to the jigsaw in my theory would have to be replacing Hodgson with a world class manager who can commit to Liverpool for 10 years minimum who will be able to attract the worlds best players. If this all doesn't happen, then i am sorry to say but Liverpool are likey to become the next Leeds United or Newcastle as appossed to the next Chelsea. This of course is without selling Gerrard and Torres. The only possible way to recoup a US$2 billion investment is to have a world class 70,000+ seater stadium, a world class manager, half a dozen world class players, a world class youth academy and a full trophy cabinet full of colour pictures, not black and white memories. Liverpool will rise again. Best wishes to Gerrard, Torres, Kuyt, their team mates and their legion of admirers.